Gary Curson's sax has made him a respected figure of the free improv jazz scene in the UK. He is the founder member and leader of The Number, a project featuring Keith Tippett (piano), John Edwards (bass) and Mark Sanders (drums). Gary also performs with Dreamtime and has played with Louis Moholo Trio and Louis Moholo's Viva La Black and Keith Tippet's Wild Card, among other musicians. Major influences and inspirations of Gary's unique sound include Eric Dolphy; Jackie McLean; Mike Osborn; Dudu Pukwana; Thelonius Monk; Cecil Taylor; Duke Ellington; Messaien and birdsong. Gary studied painting, taking his BA at St Martins and his MA at Slade School (1979-1984). He took up alto saxophone in 1976, aged 28 years, and taught himself to play. Gary also plays soprano sax. With his new project, The Number, Gary has recently released a new album, The Making of Quiet Things. The album is a milestone of recorded free improv Jazz, achieving a live quality that is rarely captured in the studio. The Number has recently released their first album, The Making of Quiet Things on Slam Productions. "Curson showcases a tone that, in these days of 'schooled' saxophone sounds, actually reminds listeners that there's a human being, with strong emotions and a passion to communicate same, blowing into the instrument." 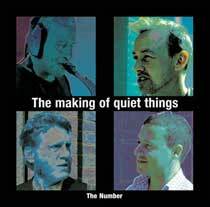 The Making of Quiet Things was recorded at Vestry Hall Studios, London College of Music in 2006. Read more about the recording of The Making of Quiet Things. The album is out now on Slam Productions. The Making of Quiet Things is out now on Slam Productions. You can purchase it now online. Click the PayPal logo below to order and pay with your credit card. "Magnificent, incandescent, full on free Improv with a strong melodic element." "Full on, fiercely interactive interplay utilising the entire dynamic and textural range of each instrument"